“Students as Partners” (SaP) in higher education re-envisions students and staff as active collaborators in teaching and learning. Understanding what research on partnership communicates across the literature is timely and relevant as more staff and students come to embrace SaP. Through a systematic literature review of empirical research, we explored the question: How are SaP practices in higher education presented in the academic literature? Trends across results provide insights into four themes: the importance of reciprocity in partnership; the need to make space in the literature for sharing the (equal) realities of partnership; a focus on partnership activities that are small scale, at the undergraduate level, extracurricular, and focused on teaching and learning enhancement; and the need to move toward inclusive, partnered learning communities in higher education. We highlight nine implications for future research and practice. Lucy Mercer-Mapstone is a PhD student in the Sustainable Minerals Institute and a co-fellow in the Institute for Teaching and Learning Innovation at the University of Queensland, Australia. Lucie S. Dvorakova is an honors student with the Institute for Molecular Bioscience and a summer scholar at the Institute for Teaching and Learning Innovation at the University of Queensland, Australia. Kelly E. Matthews is a Senior Lecturer at the University of Queensland, Australia. Sophia Abbot is a Fellow for Collaborative Programs at the Collaborative for Learning and Teaching at Trinity University, United States. Breagh Cheng is a recent graduate of the Honors Bachelor of Science Program at McMaster University, Canada. Peter Felten is Assistant Provost for Teaching and Learning, Executive Director of the Center for Engaged Learning, and Professor of history at Elon University, United States. Kris Knorr is the Program Area Lead for Educational Development at McMaster’s MacPherson Institute for Leadership, Innovation, and Excellence in Teaching, Canada. Elizabeth Marquis is an Assistant Professor in the Arts & Science program at McMaster University and Associate Director (Research) of the university's MacPherson Institute for Leadership, Innovation, and Excellence in Teaching, Canada. Rafaella Shammas is an honors Arts and Science and Biochemistry student at McMaster University, Canada. Kelly Swaim is an honors student of history education at Elon University, United States. Aroa, B., & Clemens, K. (2013). From safe spaces to brave spaces: a new way to frame dialogue diversity and social justice. In L. Landreman (Ed. ), The art of effective facilitation (pp. 135-150). Sterling, VA: Stylus. Bird, C., & Koirala, B. (2002). Partnership in education: A review of modalities and their potential application in service delivery within the government primary education sector. Kathmandu: European Commission Basic Primary Education Project. Bryson, C. (Ed.) (2014). Understanding and developing student engagement. New York: Routledge. Cook-Sather, A., & Agu, P. (2013). Students of color and faculty members working together toward culturally sustaining pedagogy. To Improve the Academy, 32, 271-285. Cook-Sather, A., Bovill, C., & Felten, P. (2014). Engaging students as partners in learning and teaching: A guide for faculty. San Francisco, CA: Josey-Bass. Cook-Sather, A. & Felten, P. (2017). Ethics of academic leadership: Guiding learning and teaching. In F. Su & M. Wood (Eds. ), Cosmopolitan perspectives on academic leadership in higher education (pp. 175-191). London: Bloomsbury. Little, S. (Ed.) (2011). Staff-student partnerships in higher education. London: Continuum. Marquis, E. (2016 unpublished manuscript). Undergraduate research and student-staff partnerships: Supporting the development of student scholars at a Canadian teaching & learning institute. McMaster University. Manuscript in preparation. Matthews, K.E., Cook-Sather, A., & Healey, M. (in press). 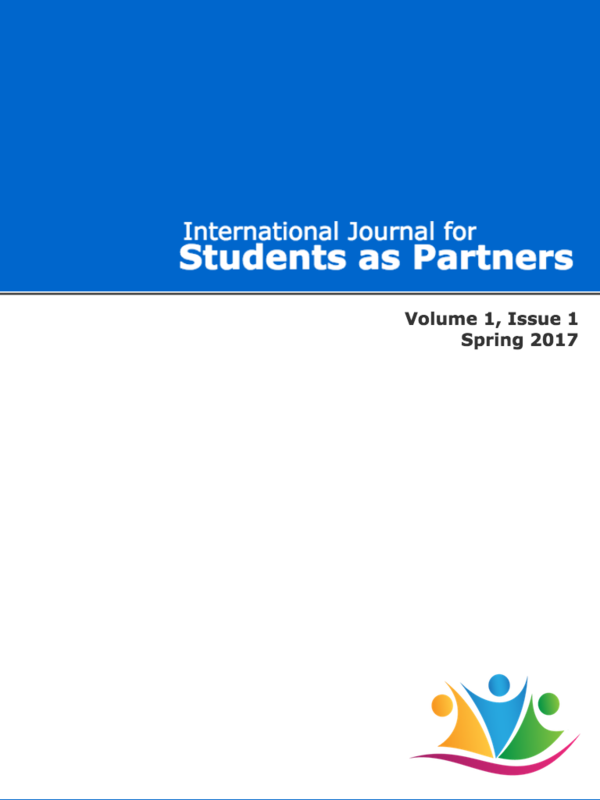 Connecting learning, teaching, and research through student-staff partnerships: Toward universities as egalitarian learning communities. In V. Tong, A. Standen, & M. Sotiriou (Eds. ), Research equals teaching: Inspiring research-based education through student-staff partnerships. London: UCL Press. Mercer-Mapstone, L., Dvorakova, S. L., Groenendijk, L., & Matthews, K. E. (in press). Idealism, conflict, leadership, and labels: Reflections on co-facilitation as partnership practice. Teaching and Learning Together in Higher Education. Neary, M. (2014). Student as producer: Research-engaged teaching frames university-wide curriculum development. CUR Quarterly, 35(2), 28-34. Newton, F., & Ender, S. (2010). Students helping students: A guide for peer educators on college campuses. San Francisco: Jossey-Bass. Taylor, P., & Wilding, D. (2009). Rethinking the values of higher education: The student as collaborator and producer? Undergraduate research as a case study. Gloucester,	England: Quality Assurance Agency for Higher Education. Werder, C., & Otis, M., (Eds.). (2010). Engaging student voices in the study of teaching and learning. Sterling, VA: Stylus. Werder, C., Thibou, S., & Kaufer, B. (2012). Students as co-inquirers: A requisite theory in educational development. Journal of Faculty Development, 26(3), 34–38. Copyright (c) 2017 Author Authors retain copyright and grant the journal right of first publication with the work simultaneously licensed under a Creative Commons Attribution License that allows others to share the work with an acknowledgement of the work's authorship and initial publication in this journal.